iGEM TU Eindhoven used this part in combination with CT52-LargeBiT ("http://parts.igem.org/Part:BBa_K2065007"). These two proteins could dimerize on our heterodimeric T-14-3-3 scaffold proteins with mutation which were designed by our team. 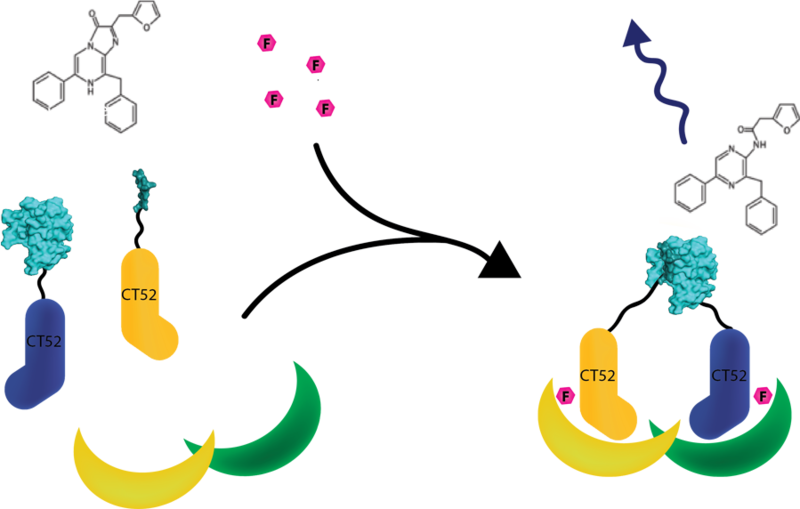 When dimerized the functional luciferase protein was formed. This protein showed luminescence at 460 nm. This system was used as a read out method for T14-3-3 heterodimers. It is schemtically visualised in figure 1. For more detailed information about the application of CT52-SmallBiT visit our wiki "http://2016.igem.org/Team:TU-Eindhoven/Read-out".